SAP offers customers the capability to extend pre-packaged content that has been previously delivered by SAP (iflows). Extension scenarios are common when customers want to bring new fields into the Cloud application from their on-premise of altogether extend end-end from on-premise to the Cloud. Starting from SAP Hybris Cloud for Customer 1702 release, Time Report can be replicated from C4C to ERP, so that CATS records can be created there. In this blog, we show what the required actions are, which have to be accomplished by the customers to enable extensibility. In C4C, adding new fields can be done in the header level (Time Report) or in the item level (Time Entry). In ERP, for each time entry received from C4C, CATS record is created in ERP. These CATS records are stored in the table CATSDB, which we should extend in ERP. However, for the time report header itself, there is no corresponding object in CATS interface in ERP which can be created to represent time reports of C4C. Therefore, all the fields which are extended in the time report level, and we are interested in moving them to ERP, we should store them in CATSDB too. Example: if a time report header has been extended to have one new field ZZ_H. Time entry has been extended to have two new fileds ZZ_F1 and ZZ_F2. CATSDB table has to be extended to have three fields ZZ_H, ZZ_F1 and ZZ_F2. Then, for each CATS record which is going to be created in ERP, three fields should be filled: ZZ_H, ZZ_F1 and ZZ_F2. To extend CATSDB table, a customization include CI_CATSDB is provided in this table. The customer has to create it and add the fields to it. After activating it, the table CATSDB will be extended to include the new fields. In the following screen shot, we see that CI_CATSDB has three fields: ZZ_H, ZZ_F1 and ZZ_F2. In the middleware the message mapping COD_ERP_TimeReportReplication is used to map the C4C message to the IDoc COD_CATS_TIME_REPORT01 which is used to post time entries in ERP and create the corresponding CATS records. As shown in the following screen shot, the IDoc is structured to have a dedicated one segment E101COD_S_CATS_TIME for time report and one or several segments E101COD_S_CATS_TIME_I for time entries. 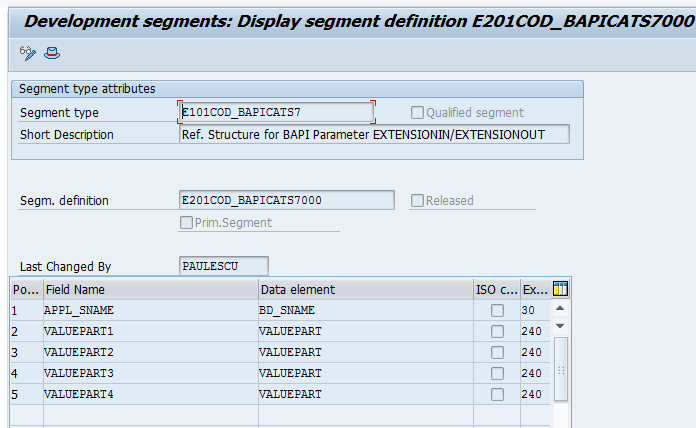 In the segment of time entry, there is a sub-segment E101COD_BAPICATS7 for the extended fields by the customer. Each new extension field in the time entry level has to be mapped to the extension segment in IDoc. Each new extension field in the time report level has to be mapped and copied to the all extension segments of all time entries of the current time report. APPL_SNAME: It should not be mapped by the customer. Keep the first 10 characters empty. 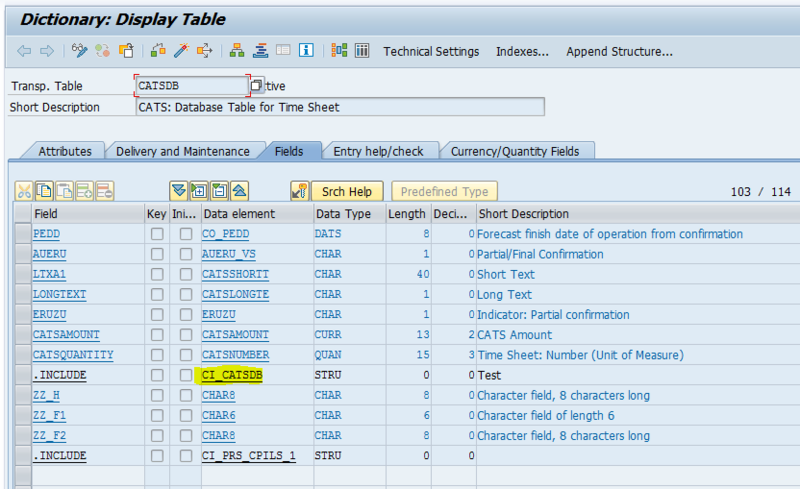 Respect the sequence of the custom fields defined in ERP in the structure CI_CATSDB from the CATSDB table. Respect the data length of each field defined above. The total length of all extension fields should not be more than 950 characters.